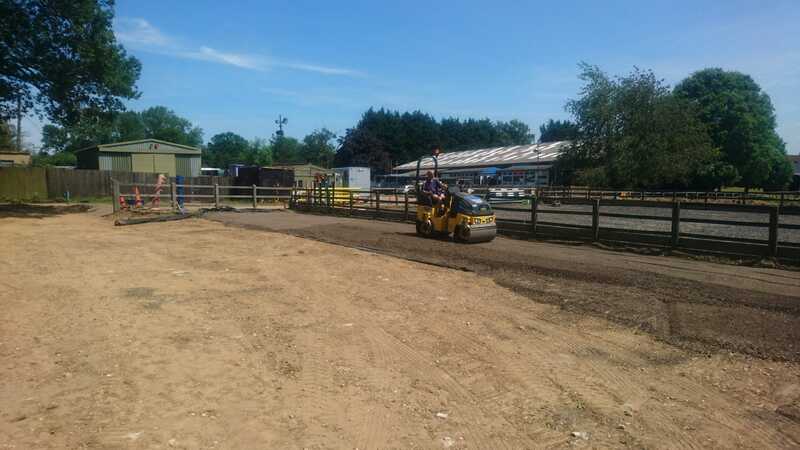 On this project we converted one of the fields into a new carpark 1800m2 in size, constructed a new road with kerbs, edgings and ACO drain, partly full construction tarmac and partly overlay. Break out existing concrete stables and yard area and reinstate with tarmac to allow horse boxes through the stable yard. After completing these works, they explained to us that they were having problems with flooding and if we could alleviate the issue in any way. 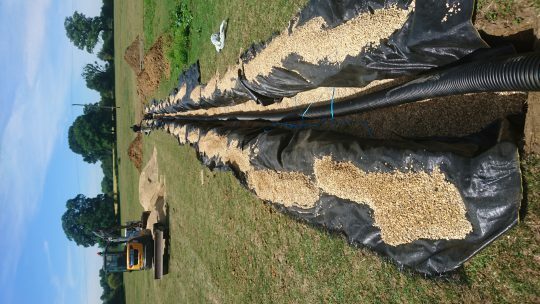 We agreed upon the idea of a soakaway system and proceeded to install 160m of perforated land drain to their nearby field in which we created a 30m3 soakaway. This proved to be effective at the next downpour and solved all flooding issues. They then asked us to install a garage base slab and two new concrete slabs for stables and a new concrete stable yard complete with gulley drains and ACO drain connected into the new soakaway system.